Don’t feel like cooking over a hot stove? With just a little chopping and whisking you’ll have a protein-packed salad that is healthy and filling. My husband and I usually have this as our main meal but it can be served as a starter for 4 people. 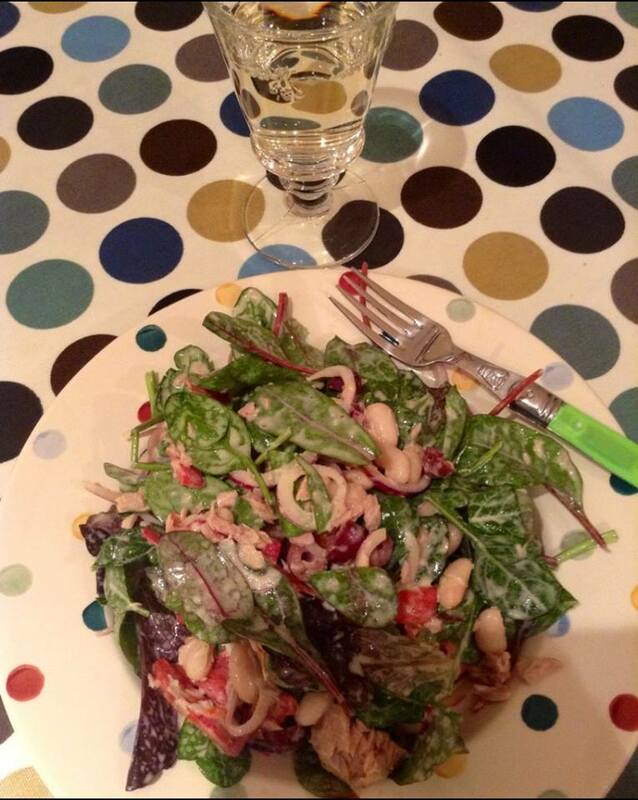 Put a small bag of any leafy salad in a large bowl. 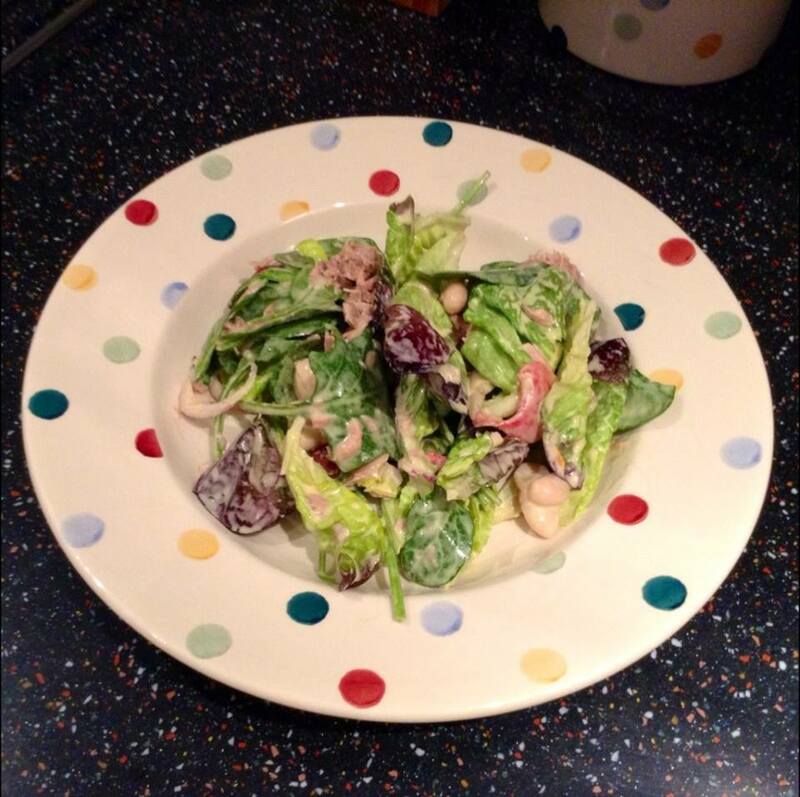 Don’t use crisp lettuce as the dressing will not coat properly and this affects the taste. Chop some roasted red peppers from a jar, a small red onion and pitted black olives (I recommend Kalamata olives for extra flavour). A large handful of each will do. In a medium bowl, whisk 1/4 cup olive oil, 3 tablespoons Dijon (or for a shortcut just use 1/4 cup Dijonnaise, but I think Dijon has an extra kick when mixed with the mayo) and 2 tablespoons white wine vinegar. The dressing will become velvety and creamy. Add a little salt and pepper. 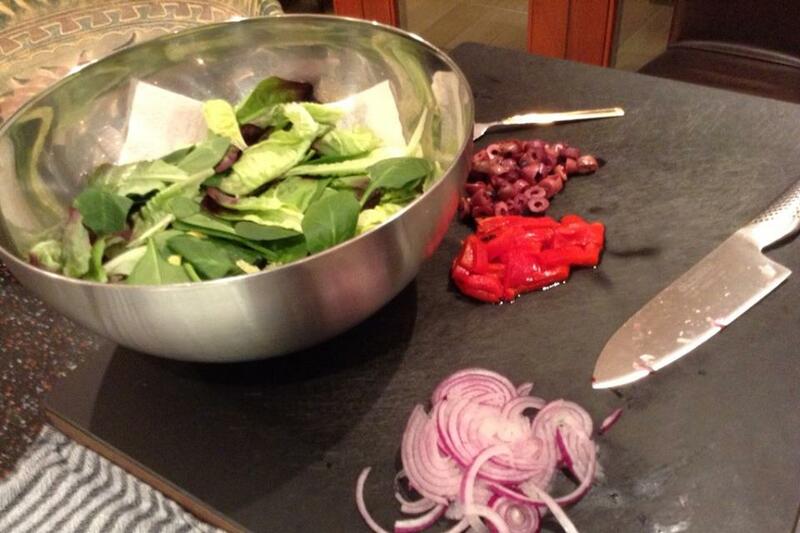 Use some of the dressing to coat the salad in its large bowl. 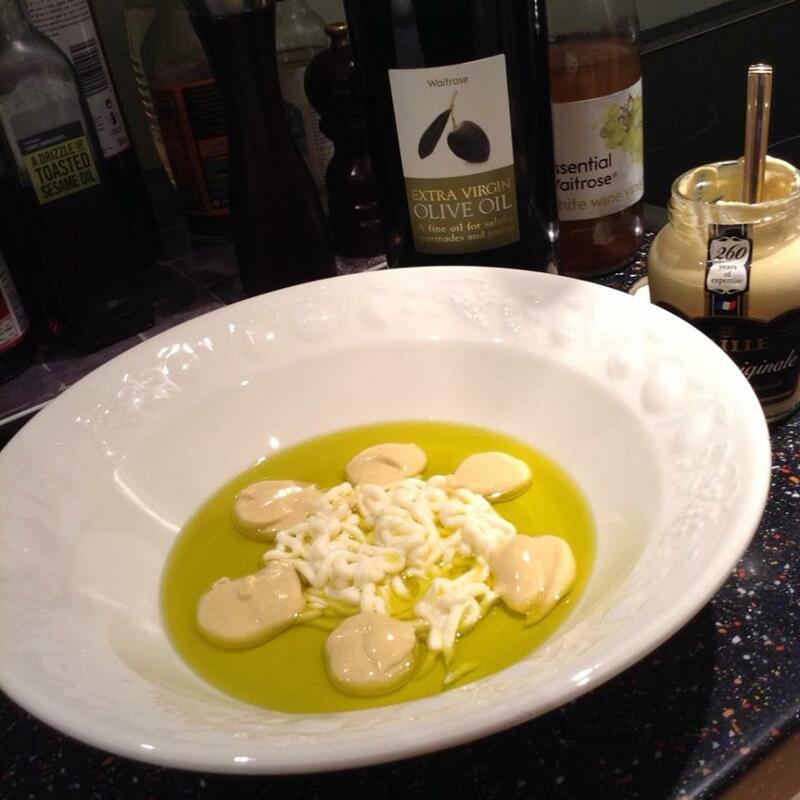 Make sure you keep most of the dressing in the bowl that has the whisked ingredients. Toss a 400g can of cannellini beans (rinsed and drained) and all the chopped ingredients in this medium bowl. 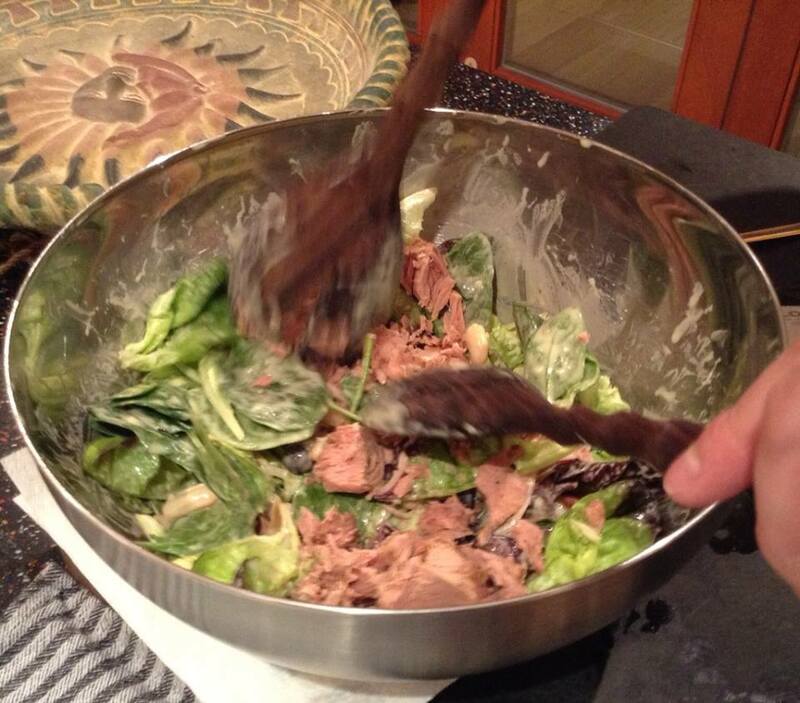 Add the mixture to the large bowl and use salad servers to toss. Add a can of chunk tuna. Toss again. Serve in plates or bowls. Fortunately, you’ll have little washing up to do so take your time and savour each bite! 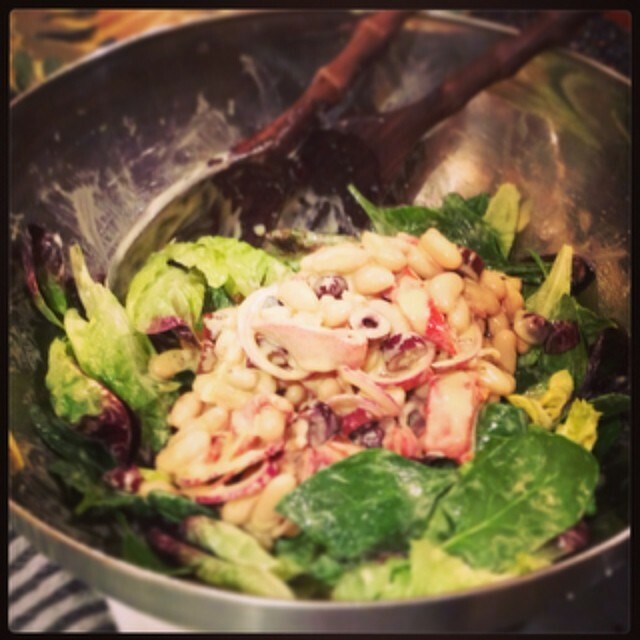 This entry was posted in Our Kitchen and tagged cannellini beans, Dijon, dressing, kalamata olives, mayonnaise, roasted red peppers, salad, tuna by One Two Culinary Stew. Bookmark the permalink.